EVRY, France, March 17, 2015 (Arianespace PR) — Arianespace has signed a contract to launch a block of high resolution imaging satellites for Skybox Imaging aboard the Vega launch vehicle from the Guiana Space Center in 2016. Arianespace is the world’s leading satellite launch company, providing innovation to its customers since 1980. Backed by 20 shareholders and the European Space Agency, the company offers an international workforce renowned for a culture of commitment and excellence. 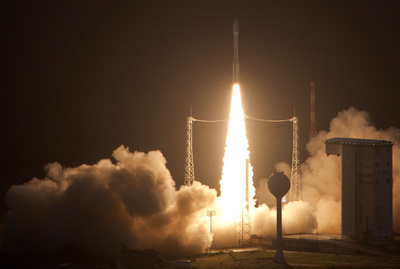 Arianespace is the only operator in the world capable of launching any mass to any orbit from the Guiana Space Center. As of March 17, 2015, 221 Ariane launches, 36 Soyuz launches (10 at the Guiana Space Centre and 26 at Baikonur with Starsem) and four Vega launches have been performed. The company’s headquarters is in Evry, near Paris, and has local offices in Washington DC (United States), Tokyo (Japan) and Singapore.